As an employee, sometimes you simply want to call someone who knows how your benefit package works and just get them to help you. The Sachs Insurance approach to enrollment and employee communication allows just this. CALL technology is just the thing to round out any employee benefit program. Your employees will receive a dedicated 800# to call with any of their benefit questions, claims resolution issues and even for telephonic enrollment. Our service team is staffed with certified professionals who can handle your employees every need. By simply calling the unique telephone number created for each company, employees receive best-in-class customer assistance with all of their employee benefit questions in one spot! Our staff is poised to deliver an experience that leaves employees feeling well taken care of. Tracking each call in an agency management system allows for greater issue tracking and the ability to recognize and identify patterns. 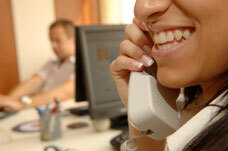 The service your employees will receive through our call center will be second to none. Tens of thousands of employees use this high touch service to make their lives just a little bit easier.